I'm overjoyed to report that my favourite current band, Little Comets, are on the new Radox ad. This should boost their fan-base to a more deserving figure. It's no surprise that someone has finally caught on to their catchy, feel-good tunes and 'Dancing Song' represents Radox's 'Come to life' slogan brilliantly. Good on you, lads! Robert: My mum and dad took home videos of me and Micky when we were like 5 or 6 just being generally quite naughty and they put a soundtrack over them so instead of us speaking to each other it would be music that they liked and associated with that moment. So a track called ‘Beautiul Boy’ by John Lennon. I always get a swell of something when I listen to that song and I think it’s cos my dad associated that with me and Micky when we were little. 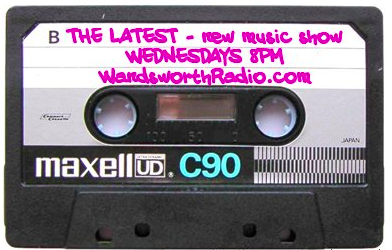 Why do you guys think the North East is producing such good music at the moment? I don’t know. There are a lot of really good bands. We were listening to Mammal Club yesterday. That’s just fantastic music. How somebody hasn’t picked up on that I don’t know. I think Newcastle is quite an isolated place and the North East is pretty isolated so it has a real sense of identity in its music. And I think we notice a lot of North East music has the same melodic intonations from, like, Northumbria folk music. So if you listen to Sting or Dire Straits or, more recently, Maximo Park, you can hear certain phrases. It’s not that people copy each other, it’s just inherent, it’s like from the land. You almost inherit it. 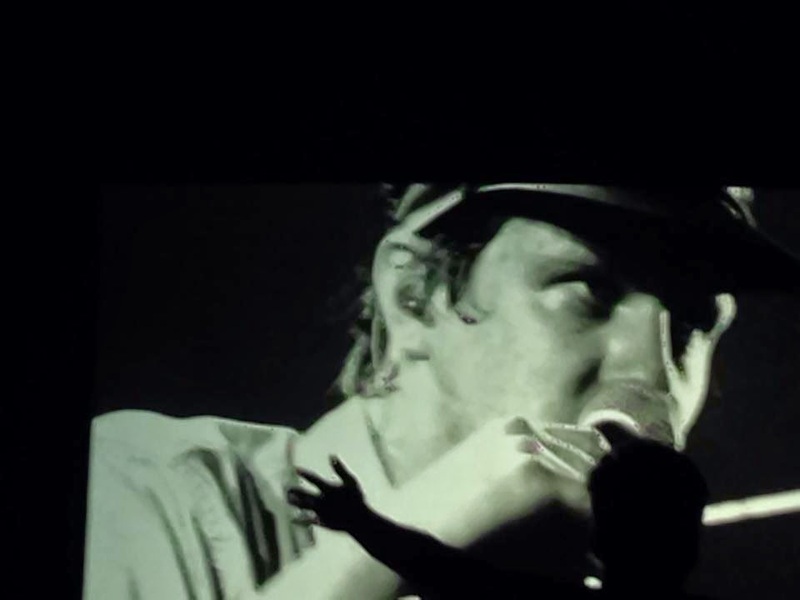 You (Robert) use lots of different parts of your mouth to song and that makes you guys sound really distinctive. How did you learn to use your voice like that? Robert: I’ve just always sang how I’ve sang. I didn’t used to be a singer. I used to be just a bass player who did backing vocals and then the singer left. Cos we’d already written the songs and it was somebody else singing our songs. And then when he left, which was in sixth form, no one else wanted to sing so I did! And from singing really bad Bon Jovi covers when we were 14. The more you do it the more you learn your way of doing it. Did you ever have any lessons? Robert: I did, I went for a bit cos I was having trouble a few years ago looking after my voice. I’d be able to sing in the house but when I went on stage I found my throat constricted and I found it really difficult to hit certain notes. So I went to lessons for a few months and learnt loads of vocal exercises. And I think more than anything else it was learning how to breathe properly and relaxing and singing loads. I’m quite relaxed on stage now cos I know that I’m not overstretching it. I think as a band we’re a lot more relaxed. I think we’re a lot more comfortable. If you could only eat one colour of food for the rest of your life what would it be? Robert: Green. It’s good for you. It would be harsh to do, so if you did it you might as well do it for healthy reasons. Or you could blend food together to make it green. Yellow food and blue food. 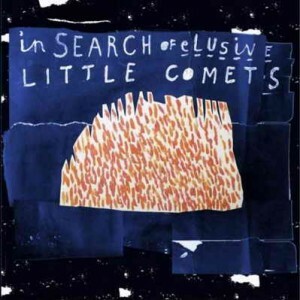 If Little Comets were a Disney character what would you be? Oh dear…I don’t do Disney. What’s Monsters Inc, is that Disney as well? One of them, the nice on in that, the big blue one. Cos he’s big, fluffy and blue. Is there any more reason to like anything! Who came up with the idea of hanging the percussion instruments on a rope above you while you play? Robert: I did. It’s cos we figured that if we had to pick them up you’d panic and just drop them when you’re finished with them. So you could smash them. So it was more efficient to string them up because then we’d get more use out of them. We’ve got a quick game of Would You Rather. Ohh we love this game. We’ve tested this game to absolute destruction. Would you rather…be a golf club or a cricket bat? Would you rather…only ever wear orange or black? Would you rather…be a king or a ninja? Would you rather…drink a shot of someone else’s urine or a pint of your own? Robert: A pint of me own. Michael: I think a shot of someone else’s, depends who. Would you rather…constantly be crying or constantly be sneezing? Unanimous: Sneezing. I quite like sneezing. Would you rather…only be able to shout or to whisper? What’s the best ‘Would you rather…?’ that you guys have come up with? Matthew: Oh no…not a good idea to ask us that question! Robert: The one I’d like is would you rather go to prison for life for a crime you didn’t commit or kill someone and get away with it? 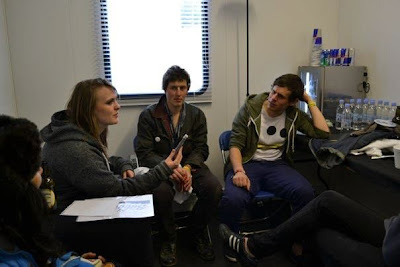 Interview with Little Comets by Sophie Ellis at RockNess Festival, Sunday 10th June 2012.